Over this winter I have been working harder than ever, out most weekends at my home club (Stokes Bay), interspersed with weekends away at Weymouth and Portland Sailing Academy or Royal Lymington Yacht Club for coaching. 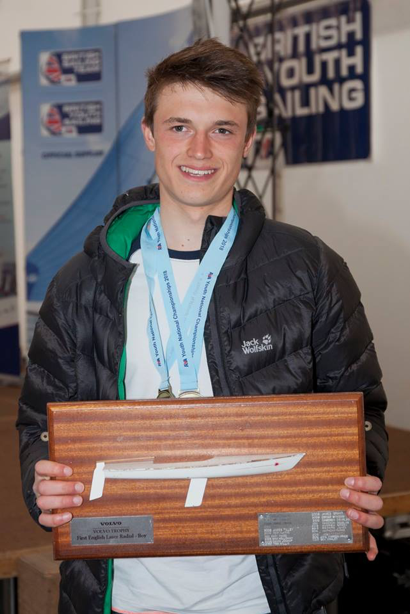 I’ve also been working with ex-Youth Squad coach Ross Harvey to improve my racing skills – the hours spent out on the water over the winter months have started to pay dividends. 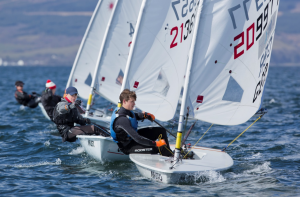 I’ve just returned from the RYA Youth Championships in Largs, Scotland which were held in the first week of the Easter holidays. The conditions were extremely challenging with a mixture of strong winds and sub-zero temperatures! As a result the first two days a racing were cancelled much to my disappointment. By Wednesday it was still cold and windy but the decision was taken to launch. Despite only achieving two races on the first day, I achieved a 1st in the second race leaving me in 5th place overall and my goal of securing a place in Youth Squad seemed a real possibility. On day two I consolidated my position with some consistent results including another 1st! Going into the last day I was still in 5th position but with only 4 points between me and first place the event was still wide open. It was another windy day (my favourite conditions) and with two third places in the final races I finished the event in 1st place and was crowned RYA Youth National Champion in the Laser Radial Boys fleet! I couldn’t be happier with my result which also means I have realised my ambition of a place in the RYA Youth Squad. It promises to be a busy and exciting summer of sailing; I have been selected to represent Great Britain at the 2018 Youth Sailing Worlds Championships in Corpus Christi, Texas in July. Only one sailor per class is eligible so I feel very privileged to be selected. This is followed by the Laser Youth World Championships in Kiel in August. These events will be challenging, hugely rewarding and a big learning curve as I will be competing against the best youth sailors from around the world. In addition to my on water training I’ve also been busy working on my physical fitness, either running, cycling or working out in my home gym. I’ve also recently qualified as Level 2 RYA Race Coach which allowed me to help coach a local Topper squad which I’ve really enjoyed.